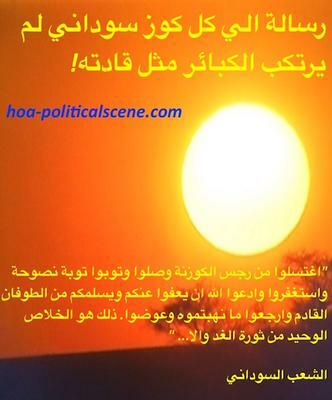 hoa-politicalscene.com/great-political-contribution-online.html - Great Political Contribution to Online Community by journalist Khalid Mohammed Osman. Journalist Khalid Osman's political contribution online is great for all of the states in our miserable Horn of Africa, which is part of miserable continent that seems doesn't see its way since the independence of many countries. Through a decade or more online he still pursuits his dream of making the Horn of Africa a better place for its people who came from one origin. He has a dream & with that dream he has a believe the dream will come true sooner, or later. I love it, the way he puts this network and control it with many of his hard duties towards humanity, especially in our miserable area. I lost contacts because his emails seem blocked. Several times I tried to contact him, but postmaster failure occurred while trying to reply to his emails. * You are at Great Political Contribution Online. * Read the comment at Great Political Contribution Online Comments. * Read the updates of the HOA Political Scene on the first of its kind blog site at HOA Political Scene Blog. * To contact Khalid Osman, send him your mobile numbers and email address on the form at Contact US. * Subscribe to the HOA Political Scene Newsletter to get Horn African political updates & some useful gifts to read, understand & use to improve your life and make it more better.